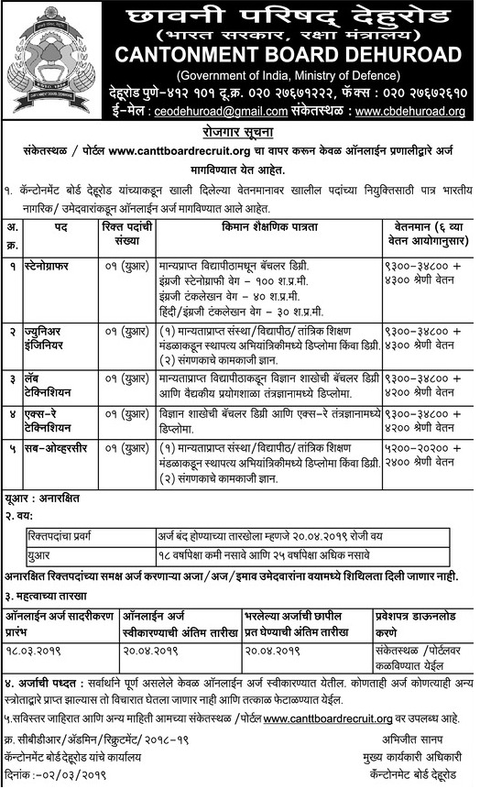 Cantonment Board Dehuroad (CB Dehu Road Pune), Pune published a new job notification for Stenographer, Junior Engineer, Lab-Technician, X-Ray Technician, Sub-Overseas Posts. The recruitment is for total 05 Vacancies. The willing candidates are informed to see the latest notification March 2019. Qualification required Bachelor Degree/Diploma or Degree/knowledge of computer and More. Last Date of online application is 20-04-2019. For More details of Cantonment Board Dehuroad Recruitment 2019 Read Below. Education Qualification: Bachelor Degree/Diploma or Degree/knowledge of computer and More. For Post wise Education Details follow the detailed advertisement. Age Limit: 18–25 years as on 24.04.2019. Interested & Eligible candidates can apply Online through the website www.cbdehuroad.org earlier than the due date. Application starts online 18-03-2019. Last Date of application is 20-04-2019.